Alex Krykanyuk at Fraser Yachts has listed for sale the 24 metre motor yacht Carbon. 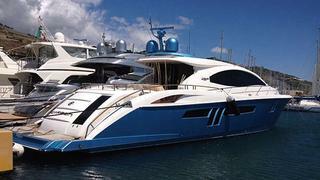 Built in GRP by US yard Lazzara, she was delivered in 2009 as one of the yard's LSX Quad models with a refit in 2012. Accommodation is for eight guests in four cabins consisting of a master suite, port and starboard VIP suites and a forward guest cabin, all with en suite shower facilities, while two crew share a cabin. The 2012 refit was extensive, involving a new navigation system, changing the entertainment systems, refreshing the soft furnishings and installing a wine cellar in the galley. She has an upper saloon with excellent views and easy access to the aft deck with teak flooring, a bar and al fresco dining along with sun pads. The saloon itself is ideal for relaxation, with comfortable custom made brown leather sofas and an entertainment system centred around a 55 inch Samsung television screen. Four Volvo Penta 435hp IPS 600 engines provide excellent fuel economy and deliver a cruising speed of 25 knots, topping out at 30 knots. Lying in Imperia, Italy, Carbon is asking €2.1 million.